When Nick Stanczyc posted this picture on Instagram someone forwarded it to me within moments. I couldn’t believe it! 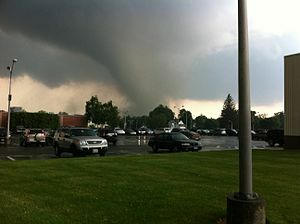 The classic looking tornado was just about a half mile away from the intersection of Rt 30 and Rt 31 in Mansfield near Storrs. On the 24th anniversary of one of the state’s most violent tornado outbreaks we got hit again – but by a much weaker storm. 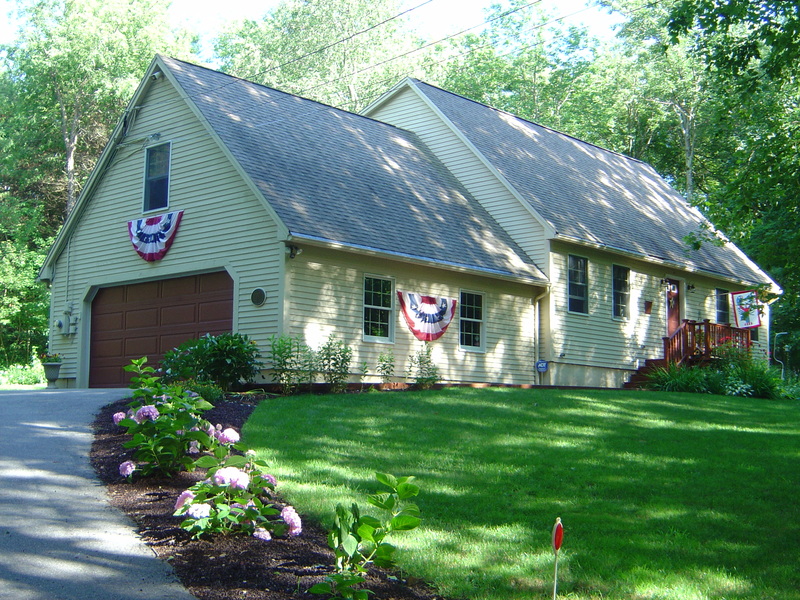 The first sign of trouble came around 1:30 when a rather unimpressive thunderstorm began to show signs of rotation over Watertown, Thomaston, and Plymouth. For a period of time while near Route 8 there was a Delta-V of 40 knots on adjacent gates in the storm’s radial velocity (i.e. 20 knots inbound and 20 knots outbound) about 4,000 ft above the ground. 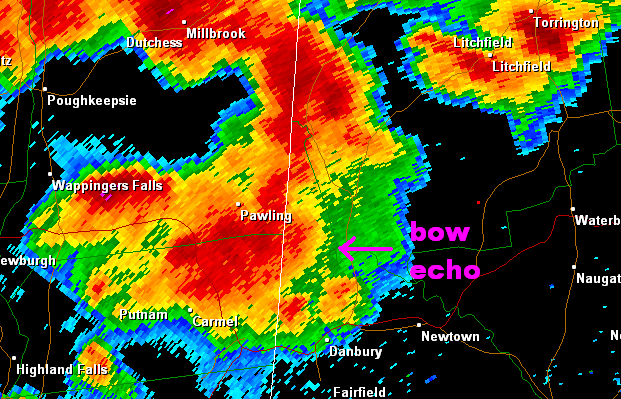 In addition, the reflectivity signature indicated a small hook echo or appendage associated with the storm. Unlike the July 1st storm (which was a low topped supercell) the rotation was seen through a large portion of the storm from about 4,000 ft at the lowest radar sample to 22,000 ft. 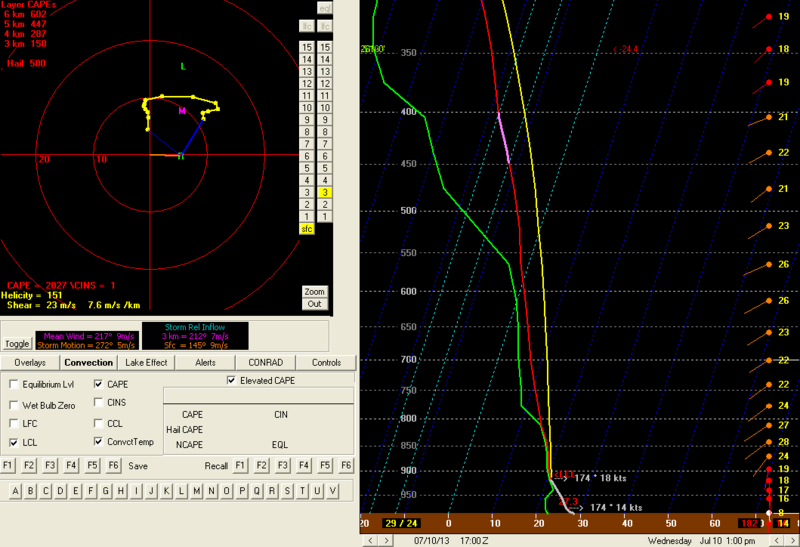 The 17z RAP analysis sounding shows an environment that was capable of producing rotating storms. The environment was quite unstable with surface based CAPE values exceeding 2000 j/kg. In addition there was fairly impressive directional and speed shear through the lowest 3km of the atmosphere. Because of this there was fairly sharp curvature of the hodograph between 1 and 2km above the ground. It’s no surprise that a somewhat discrete cell ahead of the main cluster was able to take on supercellular characteristics. The overall synoptic environment was characterized by a deep trough in the Great Lakes with a shortwave rotating underneath it through New York and New England. QG forcing for ascent was greatest ahead of this with fairly widespread shower and thunderstorm coverage. Shortly after 5 p.m. – 2 supercells had developed in Connecticut. 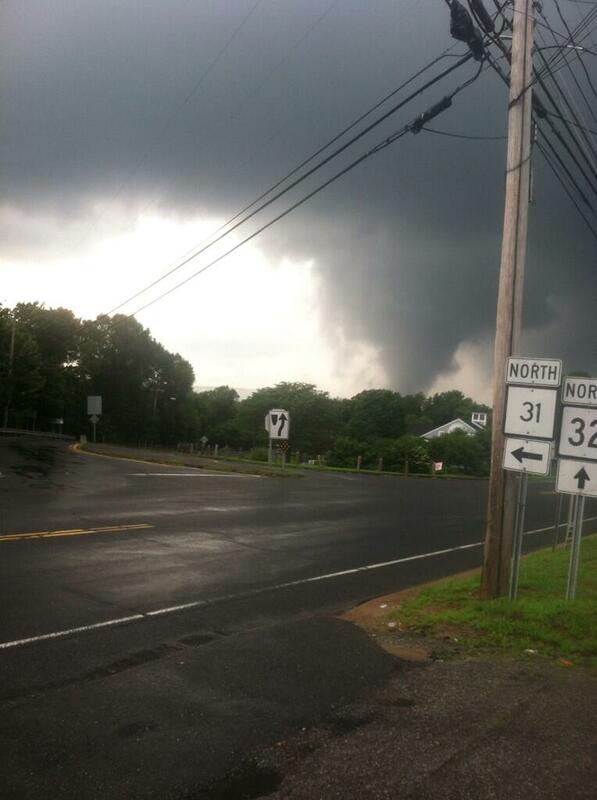 One produced some damage near Tolland and another in Coventry and Mansfield. Here’s the 21z sounding from the RAP analysis at the Windham Airport. Most of the shear is located in the 0-1km layer with a helicity of 111 m2/s2. There is about 1100 j/kg of sb CAPE and LCL heights are VERY low – about 300 meters! 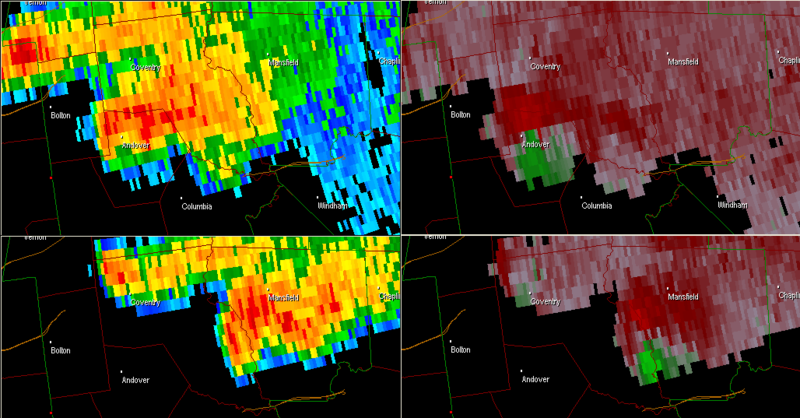 The storm in Tolland shortly after 4 was totally unimpressive on radar. There’s some signs of a weak low level mesocyclone but the storm itself was about as exciting on radar as a snow shower. 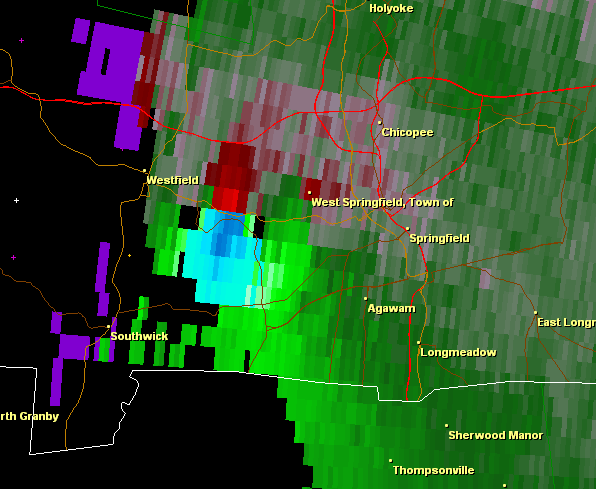 Even so, it was apparently able to produce some damage in parts of Tolland just west of the Green as it crossed I-84. 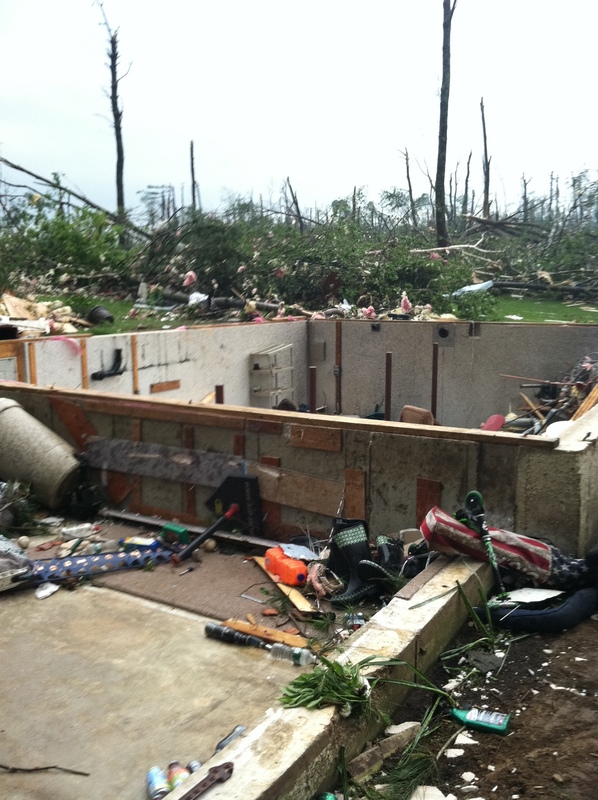 This damage was ruled to be from straight line winds and not a tornado with trees knocked down in a southwest to northeast fashion along the storm’s path. The most likely “cause” for the wind damage in Tolland wasn’t a classic microburst but rather a damaging rear flank downdraft that produced a corridor of >50 knot southwesterly winds along the storm’s path. This would make sense given the fact many people saw a funnel cloud though there was no conclusive evidence of a touchdown. As the storm moved northeast the mesocylone remained and even strengthened a bit out toward Willington and Union. It’s unclear to me what happened shortly after 5 p.m. The first mesocylone over Tolland weakened as it crossed into Stafford and Willington while a second, and stronger, mesocyclone develop on the southeast flank over Willington and then moving into Ashford and Union. This turned into the more powerful mesocyclone and peaked with a low level delta-V of about 40 knots and a tornado warning from the folks in Taunton. Whether this was simply the mesocyclone “cycling” or if this was a splitting supercell it’s hard to say based on the radar data I’m looking at now. Anyone have any ideas? The most impressive storm of the late afternoon developed shortly after 5 p.m. to the southwest of the Willington/Union storm. 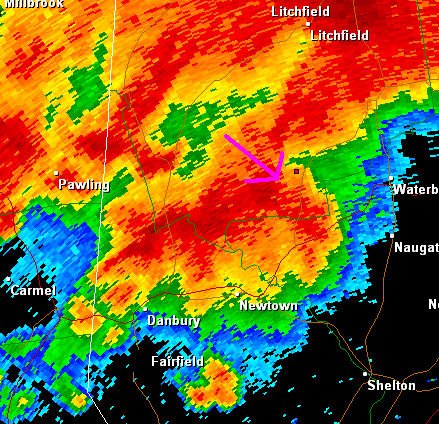 Rotation was evident as the storm left Glastonbury and it strengthened in Hebron and Andover. 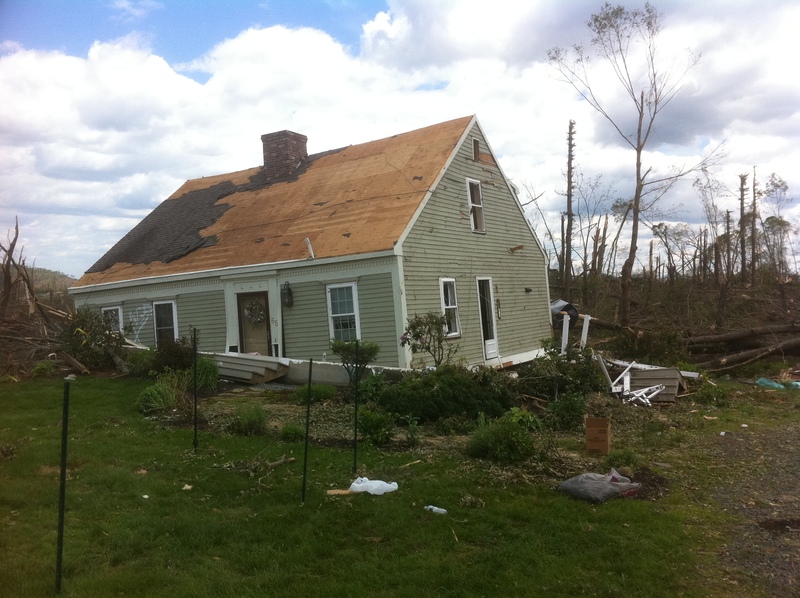 The storm produced an EF-1 tornado from Andover to Mansfield with the worst damage concentrated in an area of Coventry near Coventry Lake. Given the super low LCLs and enough turning in the lowest kilometer of the atmosphere it’s not a surprise that this storm produced. Given the advances in doppler radar (super resolution!) and the proliferation of smart phones with cameras and social media it’s not a surprise we’re hearing a lot more about these tornadoes than we have in the past. Tornadoes are nothing new here in Connecticut and even though it seems we’ve been getting an unusual amount of late this is really the way it has always been. The state is vulnerable to tornadoes and while most of our tornadoes are weak (EF0 or EF1) we have a long history of significant and violent tornadoes. Being able to hear about damage within moments and get pictures of the tornado shortly after touchdown thanks to everyone with an iPhone or Droid allows us to cover tornadoes and severe weather much more effectively. 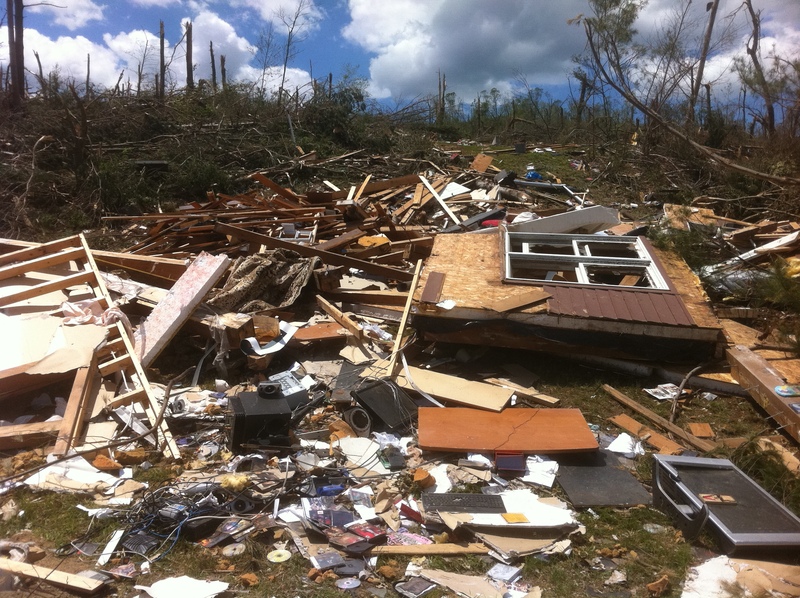 While it’s been a busy year for tornadoes in Connecticut – to be honest – we’ve just been sort of unlucky. Marginal setups have been able to produce spinners. Hopefully yesterday’s was the last tornado of the year! 5 days ago we turned in our rental car at the Thrifty location at the Denver International Airport. DIA is located several miles east of Denver (in the middle of nowhere, to be honest) and is really the start of the rural and flat high plains of eastern Colorado. Yesterday, while we were covering severe weather at the station, Twitter exploded with incredible pictures of a tornado on the grounds of DIA. 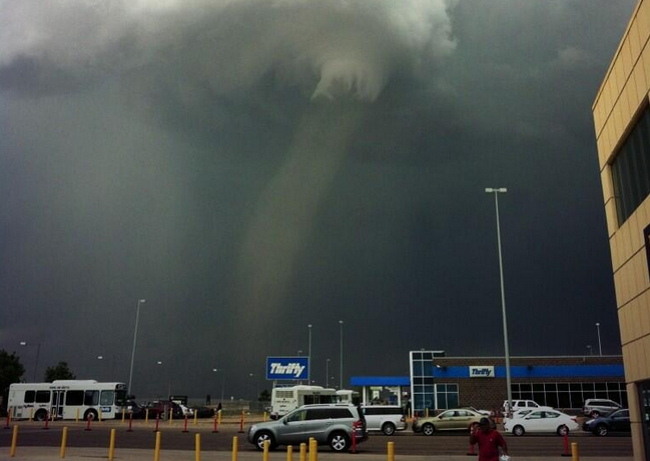 One of the most dramatic shots of the tornado was taken from, you guessed it, the Thrifty rental car parking lot near DIA. The storm was quite photogenic and almost looked more like a landspout than a classic tornado. The funnel, thankfully, avoided the terminal though it did manage to get pretty close to the automated weather observation equipment that recorded a wind gust to 97 m.p.h. before biting the dust. The contract weather observer in the tower at DIA gets mad props from me for the properly coded (and timely transmitted) METAR. +FC is not what you want to see at an airport if you’re flying. The storm also gave us a unique opportunity to look at it up close on conventional weather radar, particularly the Terminal Doppler Weather Radar at the airport (TDEN), which samples at a higher resolution than the WSR-88d. The tornado was close enough and wide enough that the actual tornadic circulation produced a “donut hole” on the TDEN TDWR image. Rain or other “stuff” kicked up by the tornado is visible around the funnel itself. The WSR-88D radar from KFTG is also quite impressive though the donut hole is not quite as visible which lower resolution. Pretty wild stuff. If only we had flown out a few days later! 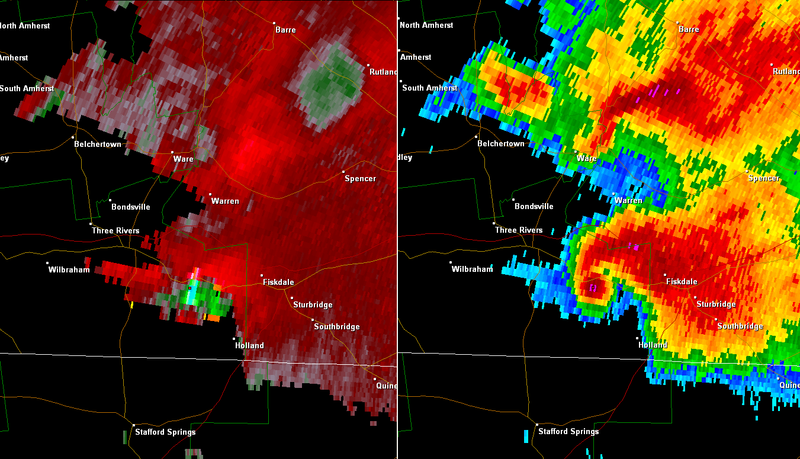 The 2009 Wethersfield tornado and 2006 Greenwich tornado were both rated F1/EF1 in Connecticut but had dramatically different looks on radar. 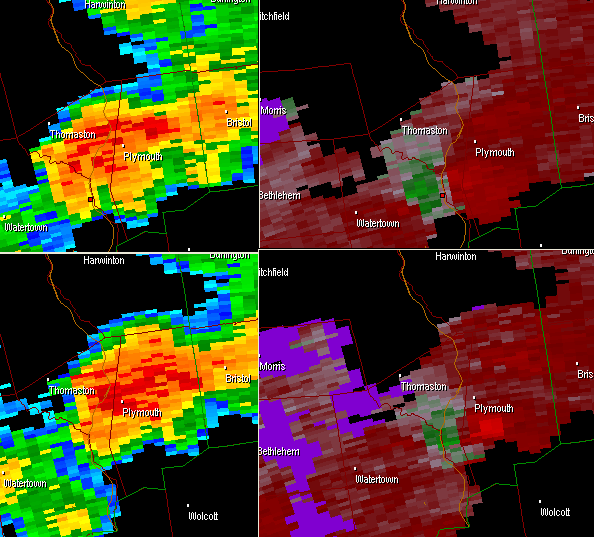 The 2009 Wethersfield tornado was, by far, a more impressive storm as a whole. Here is a cross section when the main portion of the storm was lashing West Hartford and Newington (with golf ball size hail and 55 knot wind gusts). Whoa! Now is that a classic looking storm or what!? The overshooting top reached 50,000 ft AGL with an impressive and tilted updraft. 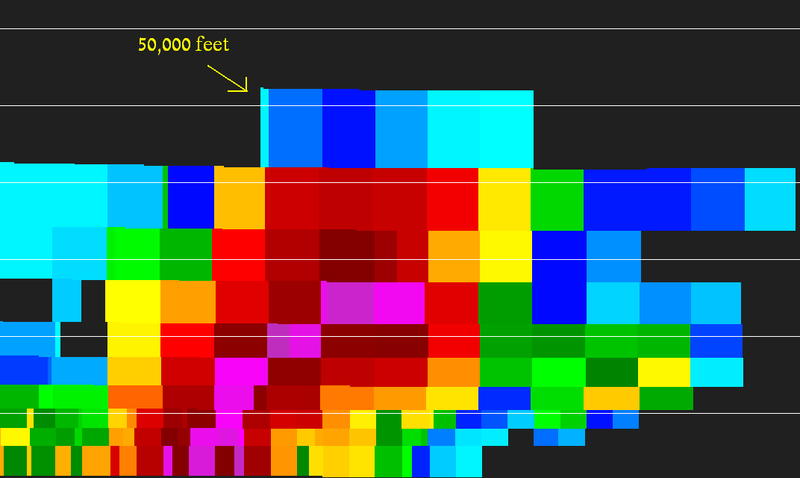 The 70 dbz level tickles 30,000 ft. Hail, hail, hail!! I did jump in the car to punch the core of this bad boy… best storm I’ve ever seen! While there was a strong mesocyclone in the mid levels of this supercell (there’s gotta be something to produce that strong of an updraft/hail core) there was little rotation evident near the ground. Blah. Sort of lame looking, right? 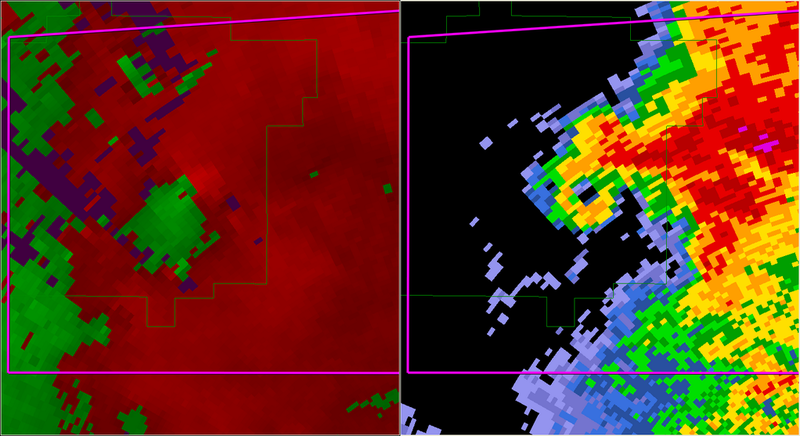 While the storm had impressive mid level rotation there was not much here (OKX 0.5º SRV) around 4,700 feet AGL. That said, the radar is sampling the storm nearly a mile above the ground. We don’t really know what’s happening around 1,000 or 2,000 ft AGL. 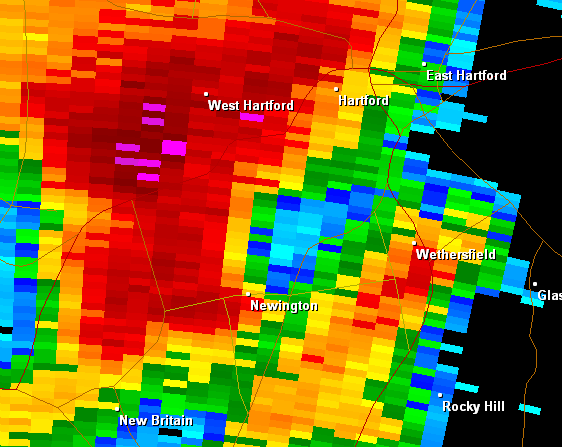 On the base reflectivity 0.5º OKX image the supercell is clearly dropping big hail over Newington and West Hartford (along with strong winds) and you can see the beginning of a hook echo trying to form over Newington? 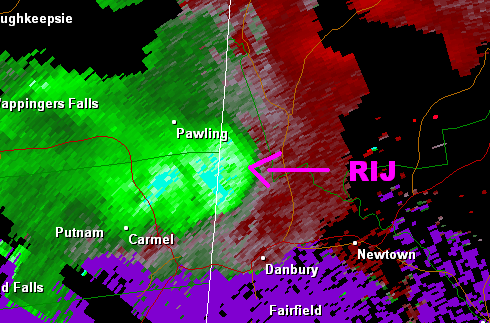 This may be a sign of the rear flank downdraft organizing which probably helped along tornadogenesis in Wethersfield. 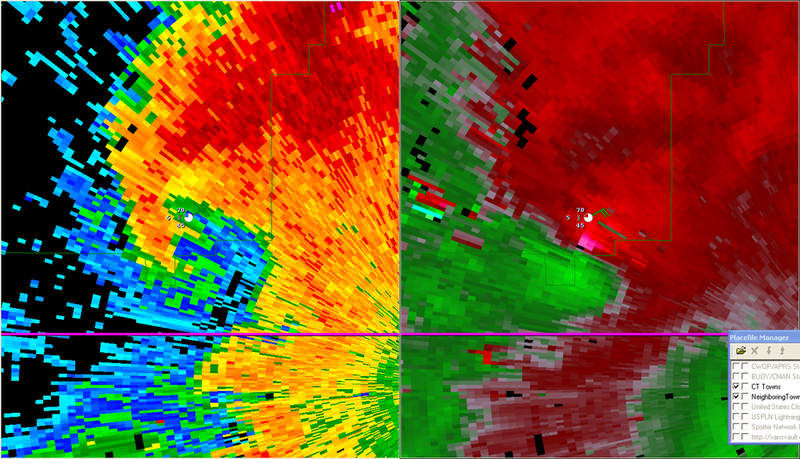 Not surprisingly, given the unimpressive low level radar look, the tornado was short lived. 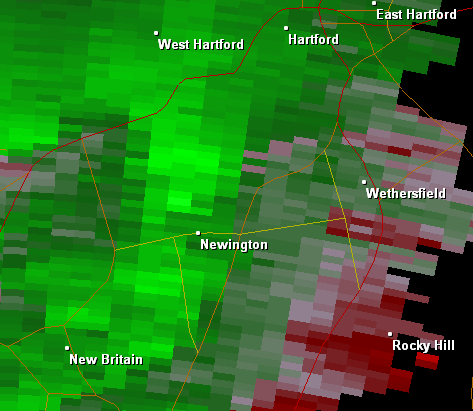 3 years prior the Greenwich supercell that dropped a tornado in Westchester County first was nearly opposite the Wethersfield case. 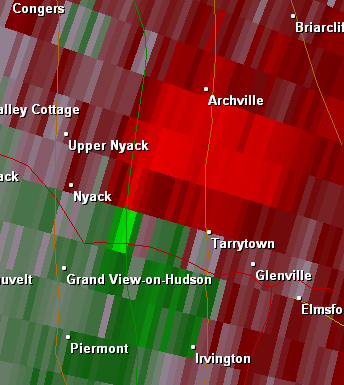 The Greenwich storm showed decent low level rotation on radar but unimpressive mid level rotation. It was an ugly looking storm. Pretty hideous, right? Just looking at this 0.5º base reflectivity slice (and let me tell you that other slices are just as ugly) you wouldn’t expect a tornado, right? An F2? No way. But…. wait for it…. Don’t you love Doppler Radar? 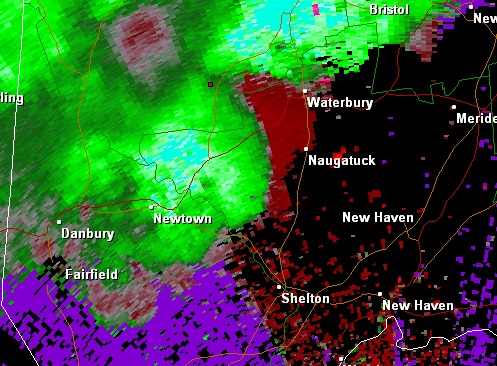 Classic tornado vortex signature with a tornado ripping across the Tappan Zee stengthening to F2 in Westchester. The moral of the story here is that most of our tornadoes don’t look as classic as last year’s Hampden County storm. Many tornadoes originate just north of the apex of bow echoes (see last year’s Woodbury tornado), some are weak spinups near the RFD of a powerful supercell (Wethersfield), while others are like the Westchester/Greenwich storm form in relatively unimpressive storms with sizable low level rotation. 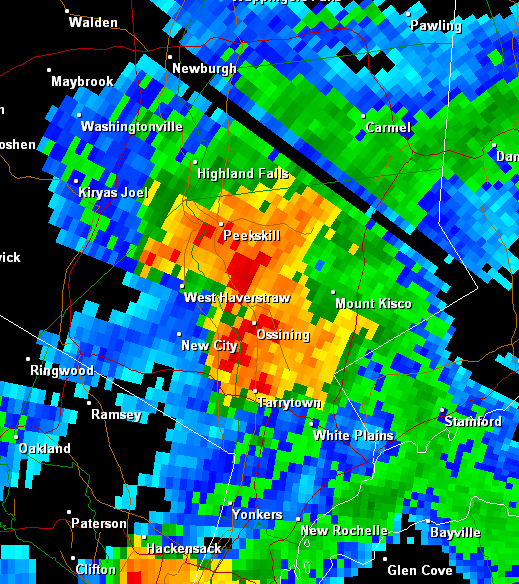 Doppler radar makes warning some storms easy – like the Greenwich and Westchester tornado. 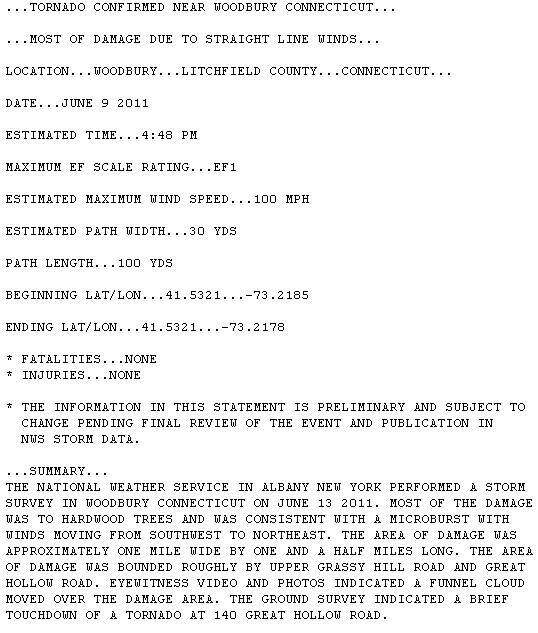 The Woodbury tornado was a bit tougher to find while the Wethersfield case shows that sometimes doppler radar can miss (especially when our radars are located in Massachusetts and New York! ).